Tessellation. I have long been a fan of the art of Maurits Escher, but until now have resisted the temptation of do tessellations. I have also been a fan of butterflies for several years. I have many photographs of them taken on hikes, and for 2 years I have been a volunteer naturalist in a nearby park, taking detailed counts of butterflies by date and species. As tessellations go this is a simple one with only a few symmetry elements. The butterflies do not completely fill the trapezoidal space available to them, but do touch at critical points. It was a choice between complete filling and making a butterfly that looks like a real one. These are not definite species, but do have a lot of resemblance to real butterflies. The brown one has many features in common with the "satyr" butterflies. The black one resembles "duskywings". The yellow butterfly has much in common with the "sulfur" butterflies. The white one is like a "cabbage white" and other white butterflies. Several dozen colors have been used, more than I have ever used before. There are several versions. 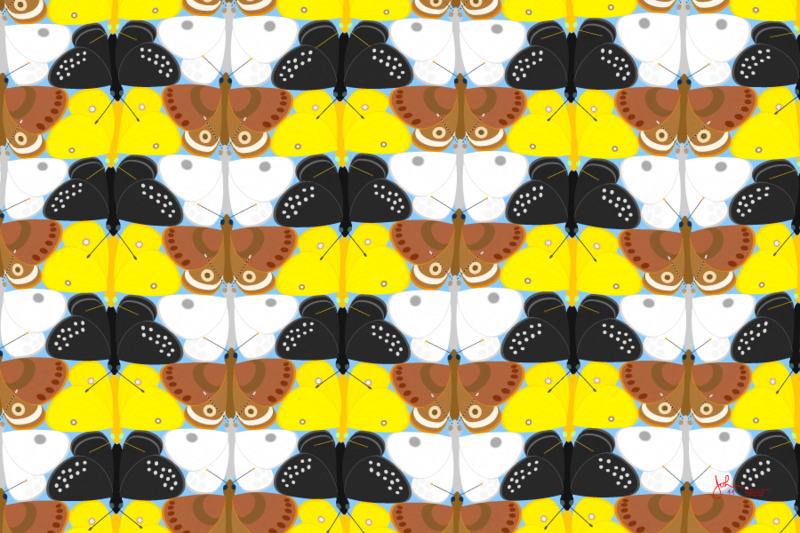 In this one not all of the butterflies are identical but a small distortion has been applied to make each one unique. Another version (not shown) has the butterfly array "flying apart" near the edges, as if they are headed off into the blue sky.